The ritual of ghost town has become part and parcel of Southern Cameroonian weekly activities. Duped Restoration Day, Denizens woke up to their weekly routine by deserting the streets of Buea, Southern Zone and other cities across the Federal Republic of Ambazonia. Everywhere has been completely ghosted as ALL ACTIVITIES remain grounded. Early this morning, August 6, 2018, Buea and its environs were completely deserted. The absence of vehicles and human movement were noticeable all through Fako county and other vicinities. 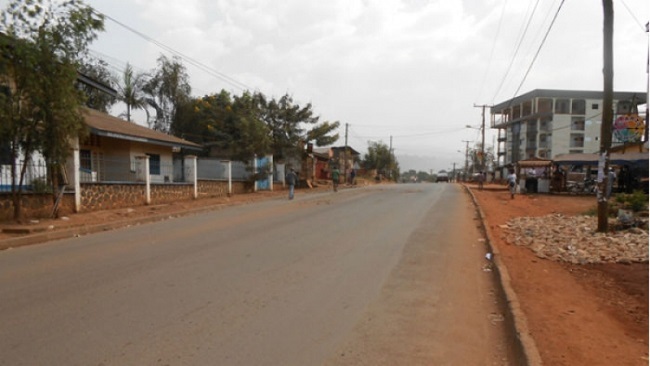 As depicted by pictures shared on social media by residents on the ground and confirmed by BaretaNews reporters, Buea was in full-ghost town mood. Other parts of the Northern Zone were also in solidarity in observing the Monday ritual. Some few weeks ago, colonial Mayor Ekema Patrick Esunge of the Buea Council had warned to use his municipal authority in order to implement punitive measures on economic operators who specifically respected calls for ghost towns but the threat seems to have fallen on deaf ears as shop owners remain defiant. Despite the threats, denizens observed the Monday ritual nonetheless. Mayor Ekema had a couple of businesse premises sealed off by council workers for respecting Ghost towns, with notices attached on them, cautioning them not to reopen without seeking permission. A move which has not stopped denizens from observing the Monday Ritual. Biya is suffering from a disease called “failure” that is politically and socially contagious. Anyone who gets too close to Biya gets infected with it. Ekema is one of the victims. Somehow, the majority of Ambazonians are immune to this disease. Thank God for this, for if not, all Ambazonians will be like Ekema. To the people on Ground Zero, we all say thank you for making us proud. But please stay vigilant of the criminal ploys of this Beti/Bulu/Ewondo slave called atanga Nji. He is a fraudstar that will stop at nothing to please the french slave call Biya.